Foton South Africa, backed by Imperial Holdings, which markets light commercials, has now developed a special edition of its 4×2 Tunland Luxury double cab premium bakkie, the Granite. 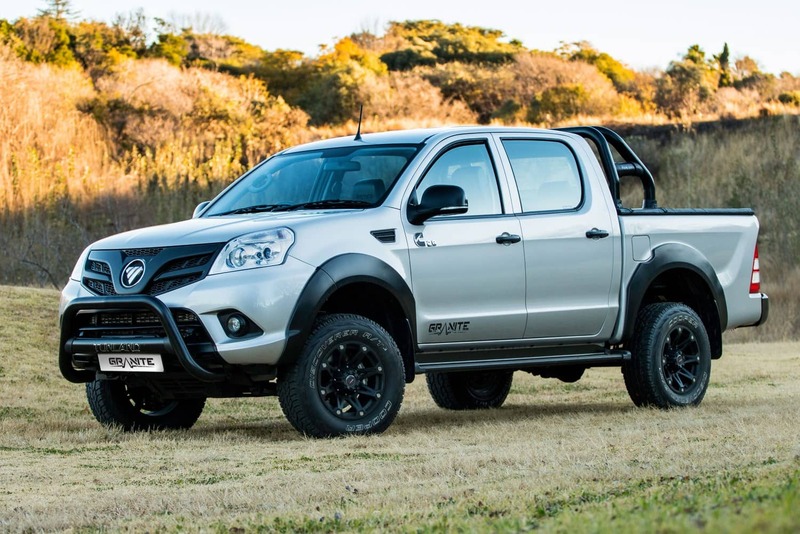 Foton South Africa, backed by Imperial Holdings, which markets light commercials, has now developed a special edition of its 4×2 Tunland Luxury double cab premium bakkie which has plenty of show. Known as the Granite it has been fitted with black accessories that change the exterior appearance significantly. Colour options for the Granite are white and silver. 150 000km warranty and has now joined the existing Tunland range. The changes start with black Hazzard alloy wheels fitted with 16 inch Cooper all-terrain tyres. Then there is a black roll-over bar and black nudge bar, as well as some special exterior black finishes. The interior is individualised with the model name Granite stitched into the covers of the front head restraints. The Granite nomenclature also appears on the bottom of the front doors and boldly on the tailgate. Furthermore, the Granite also boasts leather upholstery and Bluetooth phone connectivity. “We believe that Granite is an excellent name for this special edition as we believe this bakkie measures up to the tough, rugged and alluring nature of this very hard rock,” explained Mike Scarth, General Manager Foton SA, who is responsible for marketing Foton light commercials in South Africa. The Tunland, which was developed for international markets, was launched in South Africa initially only as a double cab 4×4 in 2012. Subsequently a 4×2 double cab followed. The Tunland not only matches up or beats its premium range rivals in terms of its overall performance, but it also has one of the most spacious interiors, especially rear seating leg room, in the premium one-ton pick-up market. Its load box dimensions are very competitive too. Towing capacity of the Foton Tunland double cab range is a tireless 2.5 tonnes. The Cummins ISF engine, which powers all the Tunland models, develops 120kW of power and 360Nm of torque and is also one of the few power units fitted to a pick-up in South Africa which complies with Euro IV emission regulations. The Cummins ISF engine is economical on fuel with a combined cycle figure of 8.3l/100km, while their emission rating is only 219gm/km. The Tunland is equipped with all the safety, convenience and security features required at the top end of the one-ton pick-up local market. The Luxury model comes standard with side steps and a tonneau cover for the loadbox besides the special features on the Granite special edition. The Tunland is sold and serviced by a healthy Foton dealer network countrywide (including Namibia and Swaziland) and besides the robust 5-year/150 000km warranty, it carries a three-year corrosion warranty and roadside assistance. The 4×2 double cabs also have the benefit of a 2-year/40 000km service plan included in the retail price. The service interval of 10 000km means that less costly and abundantly available 500ppm diesel fuel may be used.